FertilityIQ: How Does Acupuncture Theoretically Address Fertility Challenges? Acupuncture has the potential to increase blood flow to the uterus and probably the ovaries. In the case of the uterus, this helps develop the endometrium to prepare it to receive an embryo. Additionally, acupuncture may reduce “central sympathetic tone,” and in turn may slow uterine contractions at the time of embryo transfer. A quieter uterine environment helps when placing an embryo during IVF. Here the data is limited. In one small Swedish study, 10 women were given electro-acupuncture over 8 sessions and as a result their uterine Pulsatility Index (measure of blood flow impedance) dropped dramatically post-acupuncture and remained low weeks afterwards. Women who have a high (3.0) PI at the time of transfer typically are less likely to deliver a live birth. Again, the intuition is that good blood flow helps the endometrium develop and thicken, making it more receptive to receive the embryo. A study published in 1995 showed that a high PI predicted ~35% of embryo transfer failures and a smaller study in 2008 reflects that women with an elevated PI recorded lower implantation and pregnancy rates. Acupuncture may affect hormonal production and regulation in a number of ways. Acupuncture can induce the release of neurotransmitters (chemical signals in the brain) and endorphins. In patients with PCOS, acupuncture has been observed to normalize insulin sensitivity and help normalize reproductive hormones and ovulation. In a 1998 study, 90 patients given acupuncture showed dramatically increased levels of beta endorphins versus a similar group not provided acupuncture. Beta endorphin levels regulate and balance a woman’s Follicle Stimulating Hormone (FSH) levels which impact the ability of her ovaries to grow follicles and produce eggs. When tested on rats (well below our typical standards for a useful study), acupuncture was shown to improve insulin resistance. Amongst PCOS patients, insulin resistance is believed to be a driver of their condition and, in some populations, when insulin resistance is addressed, the likelihood of conception improves. Acupuncture has been demonstrated to lower levels of stress amongst fertility patients. That has the dual benefit of alleviating anxiety and plausibly increasing the likelihood that the patient will eventually conceive through IVF. Here the data is strong. 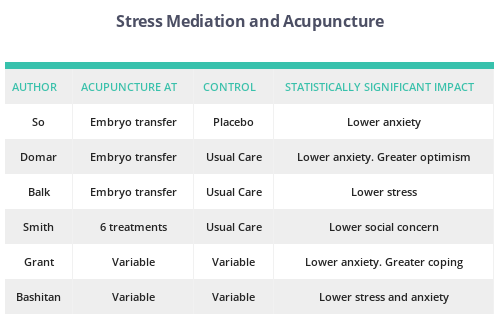 Four studies and two literature reviews largely confirm that when IVF patients undergo acupuncture, leading up to the embryo transfer and at the time of transfer, they record lower levels of stress and anxiety. While the data is mixed on how lowering levels of stress improves the odds an IVF cycle will work, it’s clear that many patients ultimately drop out of treatment based on emotional duress. The implication here is that if those patients who drop out due to emotional duress can be psychologically treated, they are likely to continue treatment, do more IVF cycles, and thus are more likely to have a child. However, as you can see below, the incremental benefit of another IVF cycle very much depends on how many have already been done (results tend to plateau between 3 - 6 cycles) and by age (gains are more modest for women over 42 years of age). Acupuncture likely improves blood flow to the uterus which has been shown to correlate to better outcomes. Acupuncture reduces levels of stress, which in and of itself make it useful, and indirectly may improve outcomes (through the patient’s ability to continue treatment). The impact of acupuncture’s effect on hormonal or immunological systems, and their impact on fertility outcomes, is less well established.